Storage condition: Kept in a dark, cool and dry place. Shelf life: 18 months when stored properly. Beta β-Mannanase, as a kind of hemicellulose, cleaves internal β-1, 4-glycosidic bonds of mannan. 1. Reducing the chyme viscosity and increasing the digestion and absorption of nutrients through decomposition of mannan. NSP. 2. 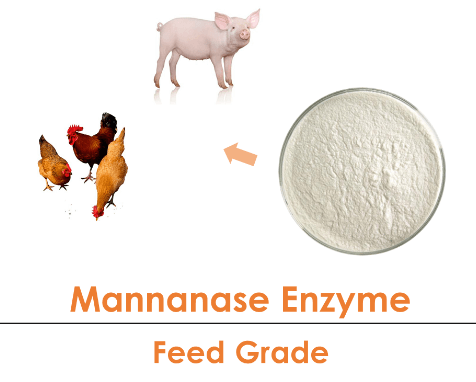 Degrading the complex of mannan and lipopolysaccharide and protein to enhance the absorption of fat and increase the energy value of feed stuff. 3. Eliminating the combination of mannan, NSP, digestive enzyme and bile salt, thus improving the digestion enzyme activity. thus enhancing the nutritional value of feed. by bifidobacterium in animal intestine, lessen the diarrhea, and ultimately improve the production performance of animal.